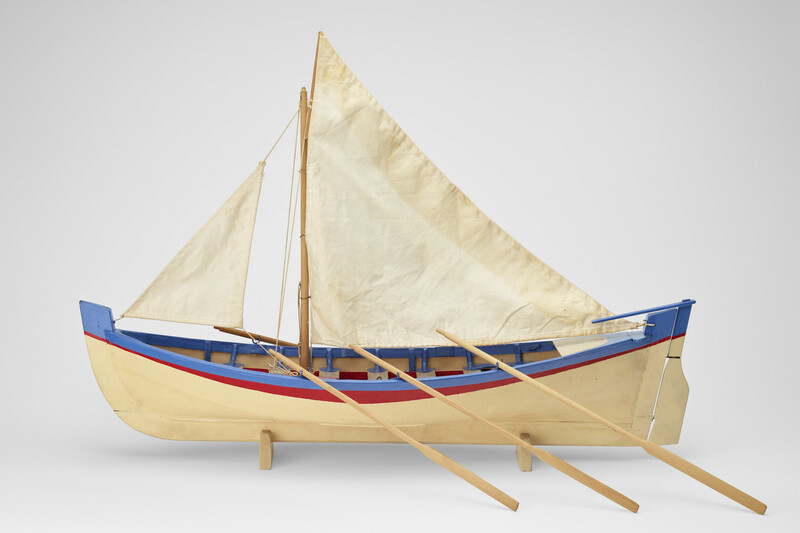 Scale (1:12) model of a Tristan Da Cunha longboat which has been made largely of wood together with canvas and cotton fittings. The hull, which is double ended, consists of a wooden frame over which has been fitted a canvas skin which is painted a cream white colour. The upper wale and capping are painted blue with a thin red line painted horizontally underneath the gunwale running from bow to stern together with the thwart stringer and mast gangboard and step, also painted red. Internally it is fitted with seven wooden thwarts and a small foredeck, together with a raised deck at the stern. The wooden hull consists of seven frames running athwartships, all of which are held in place by a series of upper stringers, painted red and blue, and six floors painted a creamy white. There are three pairs of wooden oars made in natural wood which are worked through three pairs of metal U-shaped rollards mounted single banked along the gunwale. The whole model is mounted on a pair of wooden keel supports painted a creamy white colour.